Yes, Sorkin also wrote the script, which contains that particular rhythm that characterizes his writing. 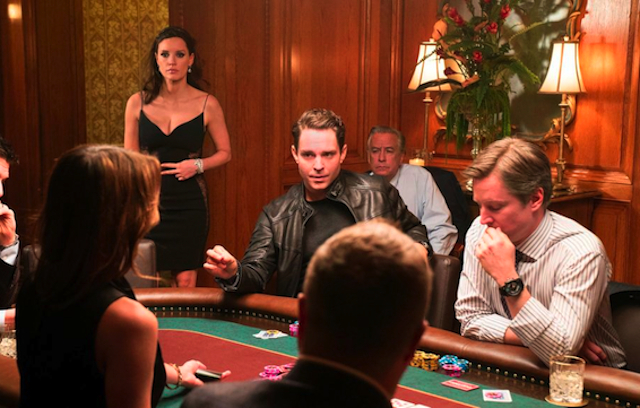 The directing is more straightforward, as the story is based on a true journey of Molly Bloom, an ex-Olympic ski athlete who morphed into the “princess” of underground poker games in Los Angeles and New York City. Inevitably, she is busted, and the film is told in flashback through the process of her legal defense. It’s an absorbing story, a bit too long, with decent performances from Jessica Chastain (portraying Molly), and Idris Elba as her attorney. It’s a full house rather than a royal flush. Molly Bloom (Chastain) is an Olympic-level skier who wipes out in a qualifying trial. Her injuries prevent her from competing again, but through happenstance she begins to run a poker game after taking a random job. Learning all the nuances of it, including tips from Player X (Michael Cera), Bloom takes over the game, and sets it up in both Los Angeles and New York City. With the game tied to the Russian mob, the FBI gets involved, and arrests Bloom on multiple illegalities. She secures a lawyer, Charlie Jaffey (Idris Elba) and he begins to piece together her defense. As she tells him her tale of the gaming operation, the “Poker Princess” also delves into the psychology of her life, which includes a father (Kevin Costner) who could not tolerate vulnerability. Costner has shifted into his “character role” mode, playing yet another father who is guiding a super ambition (see “Man of Steel”), and his early scenes are electric. One of the weaknesses of the film is his later redemption, and his attempt to connect to his daughter again, in later scenes that were really flat. There was no doubt some acceptance in the real story, but in this portrayal of his reconciliation, there was a distinct it-seems-like-a-movie phoniness. The film dropped an opportunity to authentically explore anger and father issues. 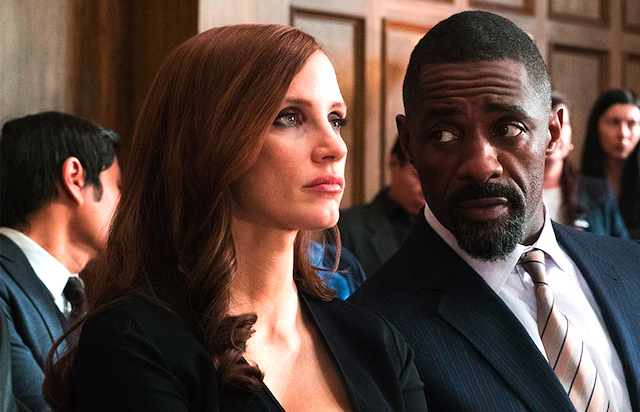 However, this is not the main relationship in the film, that belongs to Chastain’s Molly and Idris Elba as her lawyer. They have a great chemistry, and the Aaron Sorkin dialogue tumbles out of them like water. It is so much a reminder of “The West Wing” at points, that I expected C.J. Gregg to represent Molly at a press conference. I’ve complained before that Chastain’s unique movie star presence is not suited to some of the roles she picks (see “Zero Dark Thirty”), but she shines in this film, understanding the character far more than other portrayals. The film could have used one more pass in the editing machine, as subplots become stuck after being introduced, and intriguing characters appear-then-disappear. Michael Cera, for example, portrays what is rumored to be Tobey Maguire as Player X, but there is no downside to his snotty persona. Eh, maybe I’m not a fan of Cera’s characterization, but there were other players who came and went through the games, very few gaining resolution. Maybe that’s not the point in a flashback, but why put them there in the first place? The poker game shown is “Texas Hold ‘Em,’ and contains terms like the Flop, Fourth Street, the Blind, the Hole, the River and All In. Taken together, it’s can distinctly parallel life’s experiences, for in the end it all depends on the hole card and eventually the river.